ManWinWin was recognized as the 6th best rated software in the FrontRunners for Facilities and Maintenance Management report. This is the fourth consecutive time that the Portuguese software is included in the report that is based on user reviews and ratings from Gartner Digital Markets sites. 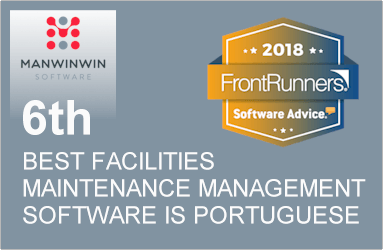 ManWinWin Software was once again considered a FrontRunners product in the facilities and maintenance management market. FrontRunners is a report compiled by Software Advice, which relies exclusively on user reviews and ratings from Gartner Digital Markets sites. Out of the 140 products evaluated, only the top 15 products in Usability and User Recommended were included as FrontRunners. ManWinWin, which has an average rating of 4.5/5 stars in Software Advice’s website, ranks as the 6th best-positioned software in the August 2018 report. Read the full report, click here. ManWinWin Software is developed by Navaltik Management, a Portuguese company of engineering consultants, founded in 1981, specialized in maintenance management and organization. Discover the reasons that make ManWinWin one of the best solutions for facilities and maintenance management, watch a demo of ManWinWin.